The arms of A-H county of Fejér (Weisenburg , granted around 1650) are still used even if now the county has much larger area. In 1550 Zala, Zemplén, Nyitra and Hont counties got Coat of Arms. 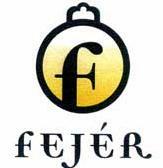 King Leopold I gave the Coat of Arms to Fejér County in 1694. The original script: "Sigillum Comitatus Albensis" King Ferdinand V. renewed the Coat of Arms in 1837. The script: "Fejér vármegye petsétje"
On the green field before the blue sky is the kneeling Saint Stephen with the Holy Crown, sword and sceptre on a red pillow on his arms. King Saint Stephen makes an offer of Hungary to the Blessed Virgin - who is in a beaming cloud - holding in her arm a little Jesus Christ. Under the pillow with the Holy crown there is the Coat of Arms of Hungary. Version from 1837 at <www.fejer.hu>. The first mention of the flag is from 1747. This flag was together with the representatives of the county in 1790 (when the Holy Crown returned to Buda from Vienna), in 1809 (battle with Napoleon), 1867 (coronation of Francis-Joseph I), 1896 (the Millenium of the Conquest), 1916 (coronation of Charles IV), 1938 (Millenium of the death of Saint Stephen). In 1949 the communist government prohibited the municipalities from using their symbols. On 13th March 1992 the county renewed the old Coat of Arms (script: Fejér megye) and the old flag. The Hungarian flag bulettin Zaszlovilag in number 1 of 1995 on page 7 there is the flag and Coat of Arms shown, but unfortunately, the description does not refer to the outer ring at all, and the images are not conclusive (at least in my copy it is not clear if there is line along letter J and M in the inscription). My only other source are stamps issued by Hungarian post in 1997, but these show the Fejer Coat of Arms entirely without the outer ring with inscription. According to images in Zaszlovilag, there are four stars in the outer ring. Also, even if that is probably hard to say in this size of the image, those stars are six-pointed (say: inscribed circle is 1/3 of the outer circle), each with two points pointing perpendicularly to the radius of the Coat of Arms connecting the center of the star . Also, probably also not visible due to the scale, the A in word VARMEGYE should have acute accent. According to <www.mno.hu>, the General Assembly of Fejér county would like to make new symbols of the county. Left the original Coat of Arms , right the Proposed New "Logo" . I think the new flag proposal is white with the new "Logo". Flying flag at the Conquest Statue, Opusztaszer NHP. Ratio: 3:1. The width of the Coat of Arms is the 1/3 of the width of the flag. The Coat of Arms is on the 1/3 of the flag's height. 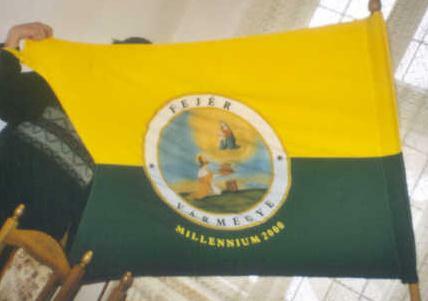 Fejér County Millenium flag - swallowtailed.